Having read and enjoyed Dan Ariely's first book, Predictably Irrational, I was excited about plunging into the follow-up titled The Upside of Irrationality. Also, after reflecting on how SuperFreakonomics(a similar book with some overlapping experiments) can save education, I set about reading Ariely's work with the mindset of an educator. Below are three chapter connections as they apply directly to the classroom. 25 years in the making, the Illinois Computer Educators (ICE) Conference has grown to a four day affair consisting of two days of workshops sandwiching two days of general sessions. Yesterday marked the first general day, and I was ready to go at 8am for the keynote. Reflections on the presentation after the jump. ICE 2011 Poster Session: Teacher Websites - What Works, What Doesn't, What To Do? 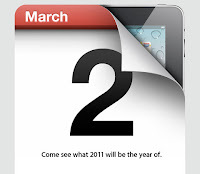 Article first published as Apple's iPad 2 Announcement - What To Look For On March 2 on Technorati. Well, we've got a date (March 2) and a theme ("Come see what 2011 will be the year of"), so the only question remaining is what the new iPad 2 will officially look and feel like. Here is a 3-2-1 of what is almost inevitably included, what's likely shelved for the future, and what's a possible sleeper pick for next Wednesday's big event. Article first published as An iPhone With A Keyboard? Three Reasons Why It Could Happen on Technorati. Well, the latest rumor about the iPhone involves a keyboard, and before you go dismissing this as another crazy story trying to drum up attention and page views, allow me to hypothesize why those innovative Apple designers could be toying around with such a configuration. Although I think there's more of a chance that we'll see an iPad mini first, here are three reasons why an iPhone "Slider" just might be in the works. Inside this issue: Black History Month on Discovery Education StreamingAnnouncing "TechSpace" (ETHS)Google Apps Transition (ETHS)Best iPhone AppsEdTech Conferencesand more! Perhaps, it's because I use Groups mostly through our school domain, which is not currently set for pre-release features, or perhaps, it's because I've been so consumed with other work, but I was pleasantly surprised to see the new Google Groups features when logging into my personal Gmail account this morning. Apparently, users were given opt-in options starting late last year, but I swear the link only popped into my account recently. Anyways, here's three reasons why educators may be particularly interested in the new Groups. Article first published as iPad App Review: The Daily on Technorati. Much liked an over hyped summer blockbuster, The Daily for iPad news application was finally released last week after press announcements, promised release dates and tantalizing previews dating back to late last year. Within a few days, the app rose to the top of the free apps chart, and thousands of reviews chimed as users created a clear divide between 1-star and 5-star ratings. The main reason for the big attention for another free news app lies with the fact that The Daily touts itself as a new way of disseminating news on the iPad. Let's take a look at what this app promises and manages to deliver. As we've been deploying document cameras to more teachers at ETHS, my first meeting with teachers generally involves setting up the machine, introducing them to the basic functions of the device, and then discussing some general ideas for how to use the machine. This month, we've continued with the second wave of training, which involves installation and exploration of the Aver+ software that is available for download from AverMedia.